The Berlin home of advertising entrepreneur Christian Boros and his wife Karen Lohmann an art historian has been sitting on my desk for months. Photographed by various photographers and showcased by the top lifestyle magazines around the globe I can’t yet stand to move the magazines into my bookcase so on my desk they sit heaped with scented candles, post it notesÂ the odd coffee cup and who knows what else. 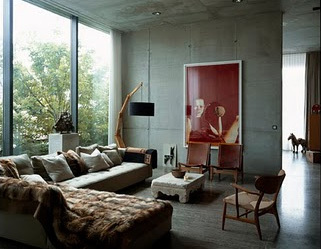 Its an inspiring home,Â the look is effortless with older pieces mingling with newer finds and even more interesting the building used to be a bunker and was built during World War II. You can’t obtain this look in a weekend it has to evolveÂ by browsing antique stores, auction houses and markets but its these veryÂ vintage pieces that give this home(and indeed any home) a heart. Vintage findsÂ tell a narrative have a personality which in turnÂ makes any home unique,Â although having said that magic only happens when you contrast and combine with newer finds. Enough from me am in desperate need for a coffee as I woke some hours ago with Maud’s paw shoved in my ear.Â Flat on her back she is taking up most of the bed I made a quick exit and have been working/pottering ever since. My favourite room in the whole house – the library. 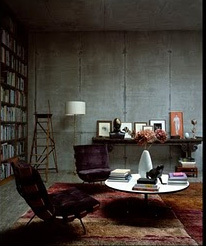 I just adore the rugs skimming the floor, the rich plummy purple fabric on the chairs, the Asian console, the modernist coffee table. A beautifully curated space where different styles come together, hang out together and create magic. The living room, softened with a throw and a zillion cushions. 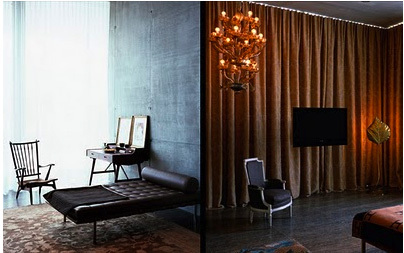 A comfortably eclectic look where textures abound and play off of each other. The dining area and outside space. 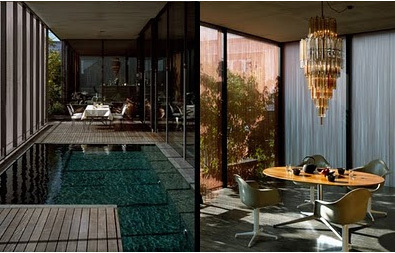 Minimally furnished (which I have to say I am rarely attracted too) however the architecture coupled with this fabulous collection of art and furniture is for me at least an inspiration.